We do bunny rescue, and occasionally breed a litter for ourselves and selected show/fiber homes. You will find any bunny that is currently looking for a new home listed here. Lizzie’s Magnificent 7. You can see how some are turning into coppers, some chestnuts (the darker), and of course, the little chocolate. Eyes and ears are just opening. In another week, individual photos will be posted of each baby. Fiber Bunny Info: These bunnies come from parents who possess beautiful sheen, depth of color, and coat quantity. In Pete’s first molt, he gave me over an ounce of prime wool! Lizzie’s fiber has beautiful sheen, and she produces babies with beautiful coats as well. They will be handled daily, and used to brushing by the time they leave here. 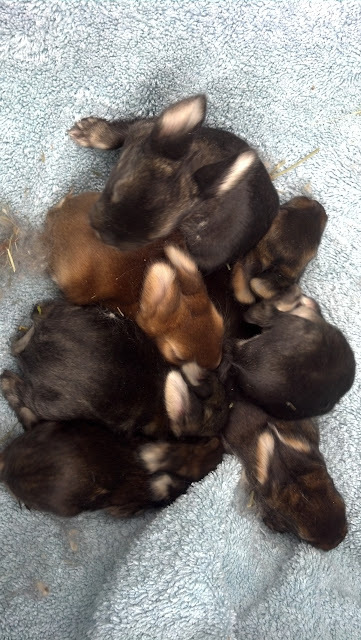 Show bunny info: This litter is linebred on Jailbird’s Lou, winner of BOB at the 2009 Convention. Lizzie is a double Lou Granddaughter, whose mother Irish Rose Louise was a RIS winner. In limited showing, Lizzie herself has 3 Grand Champion legs. Her first few litters with her breeder Anne Ott, produced rabbits who have been sold all over the country to other breeders, and are consistently winning in those locations too. A waiting list is being developed, Email me to have your name placed on this list. iam looking into starting a little satin bunny farm. do you have any kits or will you be breeding any time in the near future? or do you have any older satins for sale/adoption? Hi Keisch, Lizzie is due to have babies hopefully January 3rd, with bunnies ready to go in March. I will keep this site updated, or you can email me at oceansideangoras@gmail.com. My next litter after that will be due in April. Hi, I was wanting an English Angora, preferably REW, because I was wanting to use the wool for spinning into yarn. So I would like to know if you would happen to have any English Angoras for sale or if you might be expecting any anytime in the near or distant furture. This would be very helpful in my search 🙂 thanks.